October 17th: Gregorius had his Tommy John surgery today, the Yankees announced. The surgery went “as expected.” It was performed by Dr. David Altchek in New York. The Yankees did not announce a timetable for his return. They’ve been out of that game since the “Aaron Judge will return to game action in three weeks” fiasco. Gregorius is expected back sometime next summer. October 12th: The 2019 Yankees have already suffered a big blow. 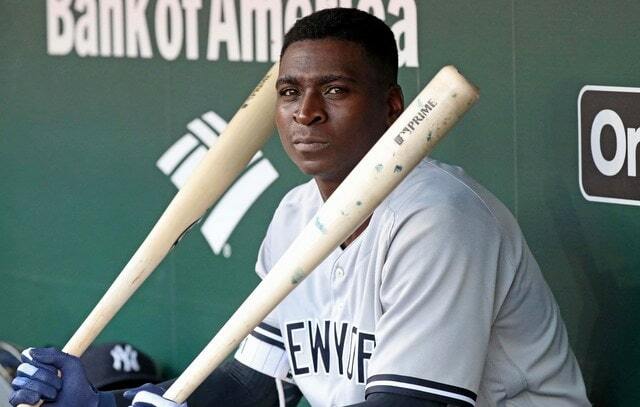 Earlier this afternoon the Yankees announced Didi Gregorius will undergo Tommy John surgery. No surgery date has been set but it will happen soon. Gregorius experienced discomfort in the elbow during the ALDS and went for an MRI earlier this week. “On the throw, (Gregorius) felt it. He just got checked out by our doctor and unfortunately he needs Tommy John surgery on his throwing arm,” said Cashman. Gregorius initially complained of discomfort after that game and then played the rest of the series with the injury. Those two bounced throws in Game Four weren’t an accident, apparently. Cashman confirmed Gregorius had a partially torn ulnar collateral ligament in his elbow when they initially acquired him from Arizona — he missed about three weeks with an elbow strain in 2013 — but he was asymptomatic until now. “(The injury) was the result of a sleeping giant, I guess,” the GM added. The typical Tommy John surgery rehab timetable for position players is 6-9 months, though Cashman cautioned they won’t have a clear picture until after surgery. The injury is to Didi’s right elbow, his throwing elbow, and Jay Jaffe found that middle infielders who had Tommy John surgery on their throwing elbow averaged a ten-month rehab. Gleyber Torres was back within eight months when he had his elbow reconstruction, but the injury was to his non-throwing elbow. If there is a a silver lining for the Yankees here, it’s the timing. The Yankees have the entire offseason to address the shortstop position — or second base position should they slider Gleyber over — but they did just lose one of their best players and one of their few left-handed hitters of note. This injury is a very big blow. No doubt about it. As for Gregorius, the timing is terrible. He is scheduled to become a free agent next offseason and now he won’t have a full, healthy contract season. It’s unclear whether the Yankees were planning to explore a long-term extension with Gregorius, but, if they were, they might hold off to see what he looks like post elbow surgery. A major bummer. Cashman was of course asked about impending free agent Manny Machado and he of course ducked the question. First of all, he can’t talk about players under contract with another team. Secondly, it would do him no good to come out and say they’re going to go all out to sign Machado in the wake of the Gregorius injury. He’s got to play it cool. “We’re scheduling the pro scouting meetings — we have those scheduled sooner than we wanted to — but we’ll go through our process and weigh all of the information,” said Cashman when asked about Machado and free agents in general. Clearly though, the Machado situation just got much more interesting (and for a bad reason). For now, there’s not much the Yankees can do other than hope the surgery goes well and Gregorius has a swift recovery. The offseason won’t begin in earnest for another few weeks, and, at that point, they’ll get together and figure out how to weather the storm until Gregorius returns.